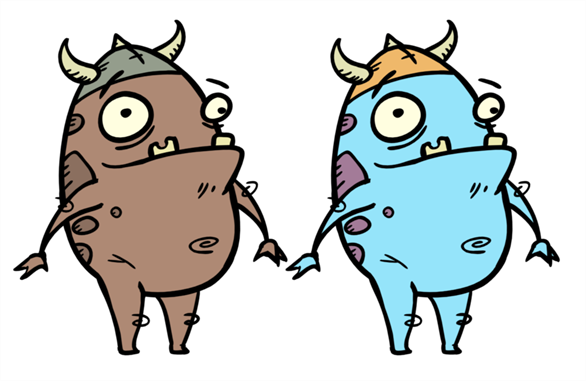 Change colour values in drawings during the compositing process. Use colour values from a specific colour palette in the palette list. Establish the priority of override palettes in the palette list. For example, you may have different clones of the same palette, such as a daytime and nighttime version. Isolate specific areas of a drawing by selecting certain colours. For example, using specific colours to generate a matte for a glow effect. The Palettes section displays the palettes in the palette list of the selected layer. You can move these palettes into the Whole Palette Overrides section to reorder them. If you have cloned palettes, the higher one in the list will override the others. This is useful for overriding the clone palette ordering set in the scene through the Colour view. You can load additional palettes in the palette list from either your project, by clicking on The Palette button, or your computer by clicking on the Browse button. The Palette button allows you to load a palette contained within the project hierarchy (Environment, Job, Scene and Elements). You can hover your mouse over the palette name in any of the override sections to display the path to the palette. The Colours section displays the colour swatches of the selected palette. Move a swatch into the Colour-Overrides section to change its value. 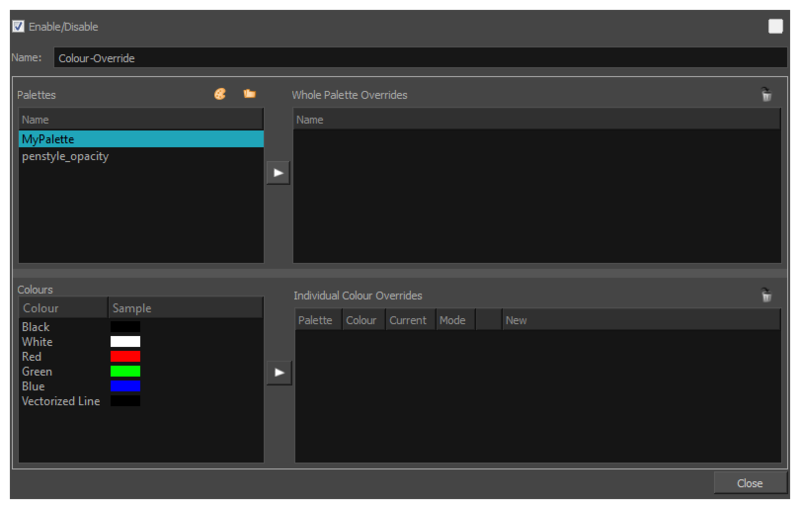 The Whole Palette Overrides section forces the use of a particular palette (clone palette) or palette list ordering during the compositing process. You must drag palettes from the Palettes section to change their order. Harmony uses the palettes in the order they appear in the palette list to find the colour values associated with the colour IDs of each colour zone. To apply a different version of a colour palette to, for example, switch from a day to a night palette, use the Override section to change the order of the colour palettes (you must be working with cloned palettes). When you drag a swatch from the Colours section to this section, you can override its value. The default override mode is set to New RGBA so you can override the RGB value as well as the transparency value. The Current column always displays the colours from the currently active palette. Selecting a clone palette in the Palettes area will not change the colours if you haven't changed the active palette in the Whole Palette Overrides section. The update will be done once you close and reopen the Colour Override Layer Properties window.